DAY 156 – 02/13/2013 – Goodbye, Sweet Book! I think it’s safe to say that I read the heck out of this book! Now, I will do something I try not to do, which is, throw it out. I try not to do this, ever. Except for old college textbooks that no one will buy or even be interested in for the next hundred years, I pass books along so that someone else can read them. On the Tramper Voyage, I search for books at Goodwill or other second-hand stores. Sometimes, someone I meet along the way will give me a book. When I’ve read the book, I give it away or leave it someplace. There’s no room for extra weight in the Tramper! The place I leave it varies. Lots of RV parks have “libraries”. Junk stores always take donations. Once, I left a pile of books at a Habitat for Humanity Re-Store. 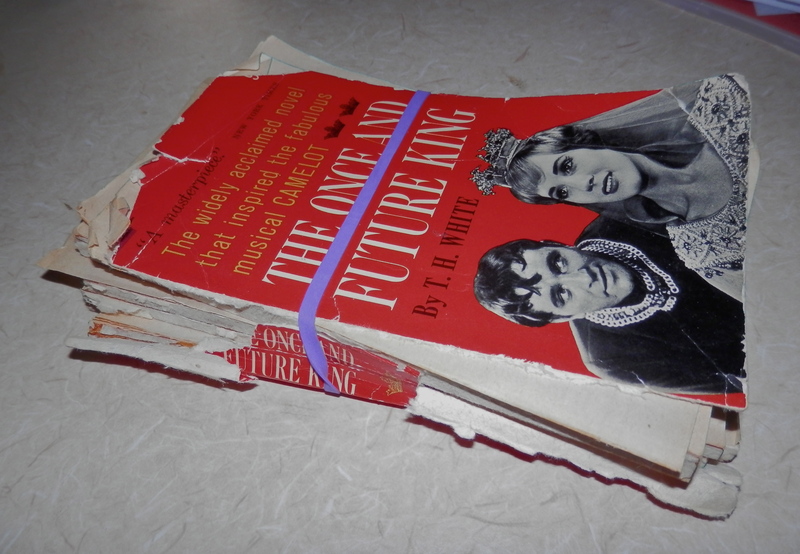 As for The Once and Future King, well, it was picked up in one of those junk stores, already well-loved by countless readers. Plus, it’s just a cheap paperback, printed over 50 years ago. My handling wasn’t rough – I promise! As I turned the pages, various leaves would pop out. Then, entire sections would separate from the binding. When I needed a rubber band to hold the book together, I knew it was doomed! This post isn’t meant to be a book review. I’m not qualified! But, I really enjoyed it. I’m a fan of the play and movie versions of this story, called “Camelot”. It was fun to recognize parts of the book that were incorporated into the movie. Other movies, too. “Monty Python and the Holy Grail” lifted concepts and entire lines of dialogue from The Once and Future King! The movie took off in flights of Hollywood fancy, though. The story of Arthur, Guenever and Lancelot was a lot longer and more mature, according to T.H. White. Imaginative recreation of the whole of English history was described by White. Lots to ponder; fun to read.